I got a picture of this Giant Swallowtail butterfly today (August 1, 2016)), a species I had never seen before. 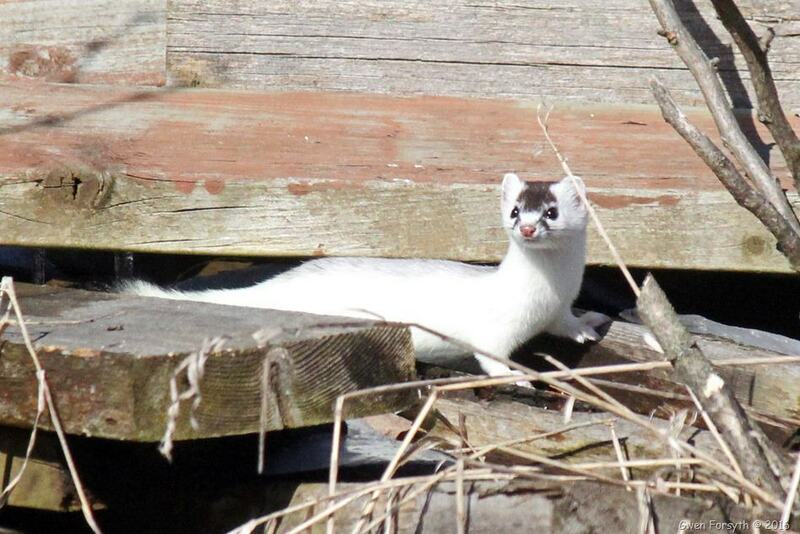 So again, something unusual has popped up at Curve Lake! I did some reading and these butterflies are moving northward. Reports thus far say that they are now found at Point Pelee and the northernmost report is from Ottawa. Note: Giant Swallowtails are a newcomer to the Kawarthas, too, and now appear to be well established. 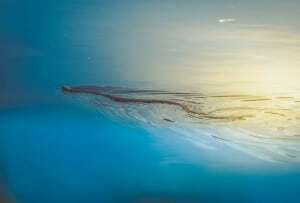 D.M. I saw my first Giant Swallowtail of the year in the garden today, hovering around the phlox. I checked the dill plantation but there were no larvae. No Monarchs have been seen. 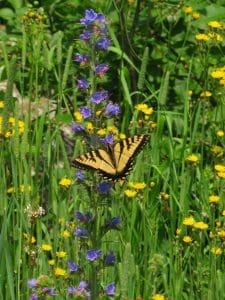 Note: I saw my first Giant Swallowtail today, too, just east of Havelock. Giant Swallowtails in the Kawarthas lay their eggs on Hoptree and Prickly Ash. D.M. 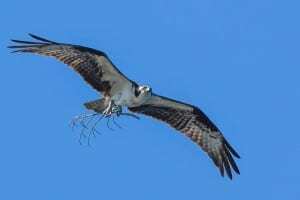 I went out early both Saturday and Sunday (June 18 and 19, 2016) on Lower Buckhorn lake and took these pictures. 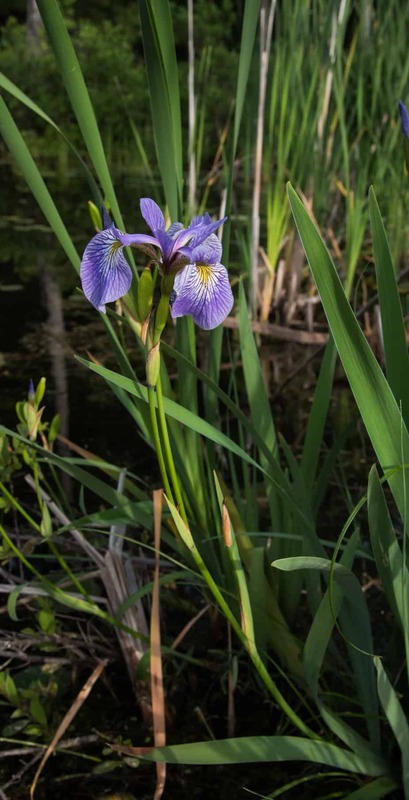 The Kawarthas is home to at least 100 species of butterflies, 135 kinds of dragonflies and damselflies and a thousand or more different moths. Learning to identify the more common species is a great way to connect to the natural world around us and get kids interested in nature. Who has not been enchanted by butterflies – the delicate, colorful wind danc­ers that are the hallmark of a warm spring or summer day? 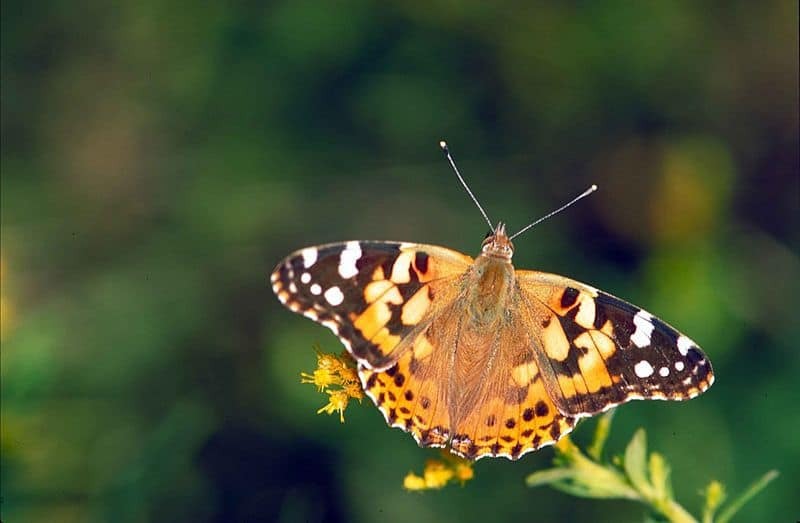 Belonging to an order of insects known as Lepidoptera, butterflies are easy to observe and turn up everywhere from woodland trails to backyard gardens. In fact, butterfly-watching also adds a whole new level of enjoyment to gardening. 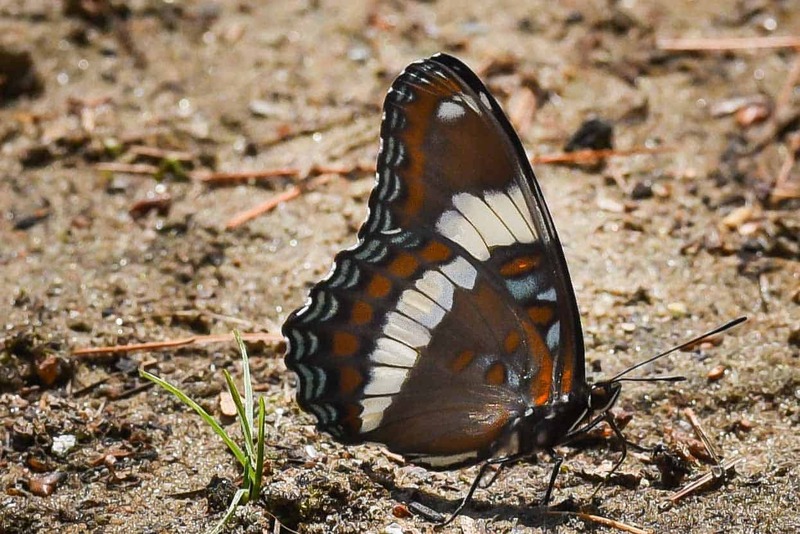 Compared to birding, which can involve getting up at the crack of dawn to take advantage of peak avian activity, identifying and photographing butterflies is a more civilized affair. Butterflies are rarely on the wing before 8 am and are most active on warm, sunny days. Getting good looks at butterflies is easiest with a pair of binoculars, especially those that focus to within six feet or less. A camera with a zoom lens also comes in handy. 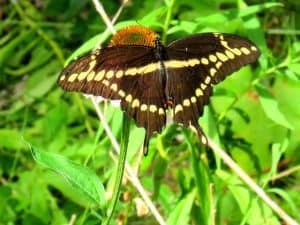 By taking a picture of the butterfly, you can identify it later. Lots of excellent guide books and apps are available such as the “ROM Field Guide to the Butterflies of Ontario” and the “Audubon Butterflies” app. Some butterfly-watchers also use a net for catching hard-to-identify species such as skippers, which tend to be very similar. 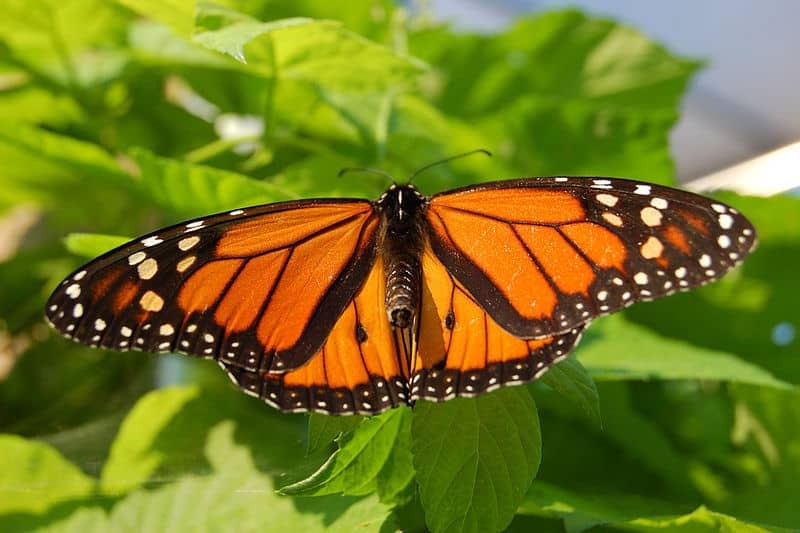 The butterfly can be transferred to a plastic viewing jar and then released. Here are a few additional suggestions to keep in mind. 1. 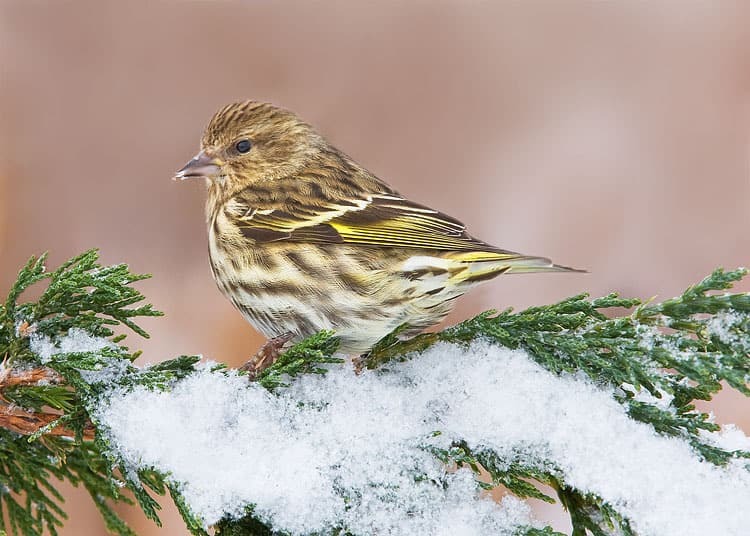 To find a given species, research the time of year it flies and its preferred habitat. 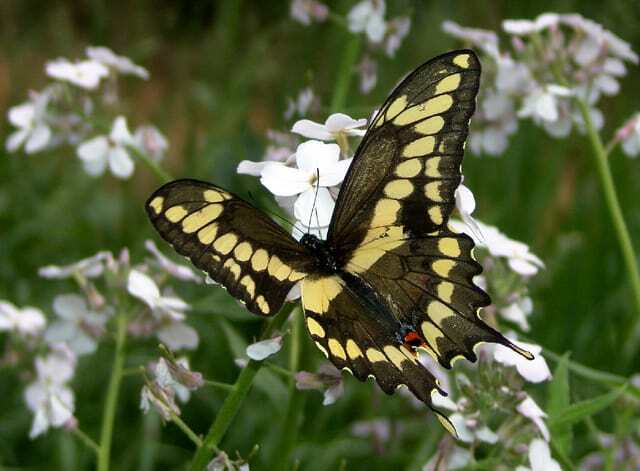 Spring azures, for example, are most often seen in May; Canadian tiger swallowtails are active in June, while many of the fritillaries are observed in mid-summer. 2. 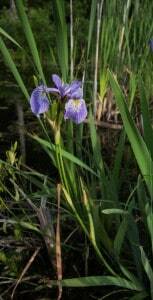 Roadsides and wetland edges can be particularly productive, as long as there are sufficient flowers in bloom. 3. 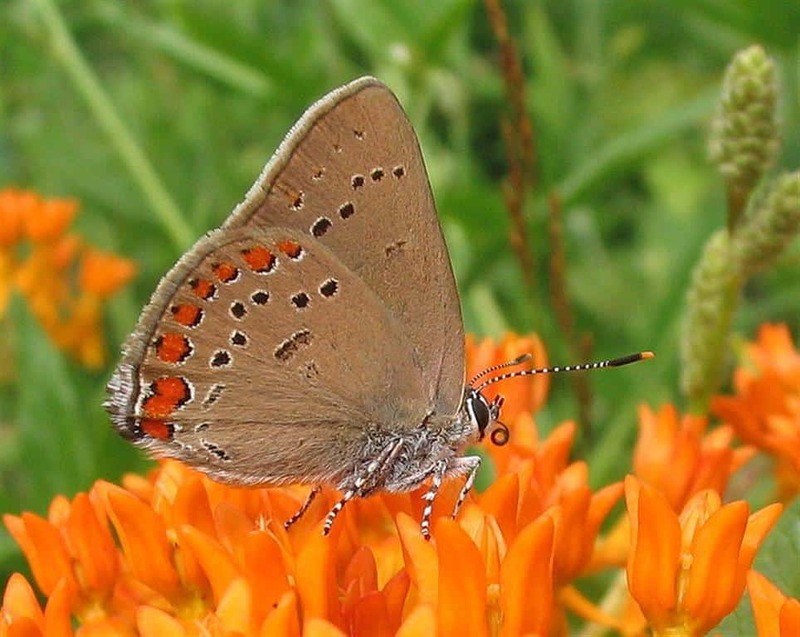 Learn to identify the plants that attract butterflies, either for nectar or as “larval plants” on which to lay eggs. Among the most important are the milkweeds. 4. 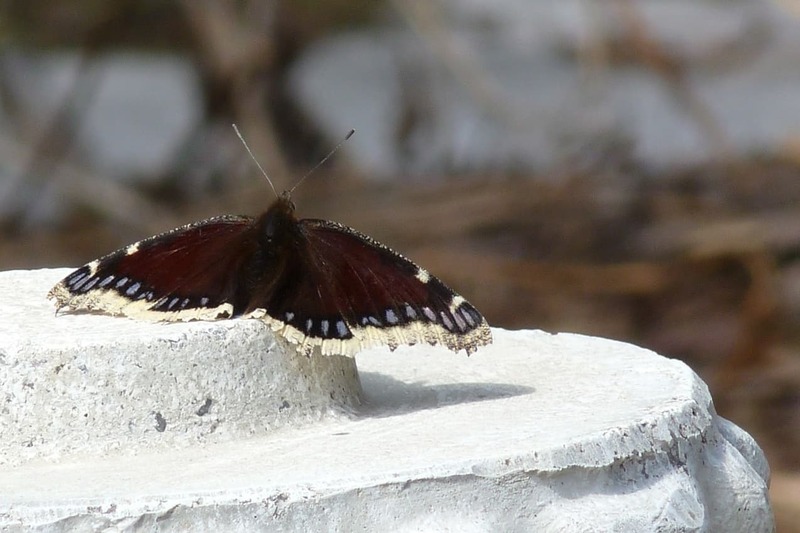 Watch for butterflies basking in the sun on gravel roads (e.g., anglewings) and tree trunks (e.g., satyrs). Some species are attracted to animal dung and muddy puddles, which serve as a source of minerals, amino acids and nitrogen. 5. Be careful not to cast a shadow on the butterfly, since this will usually cause it to fly away. 6. 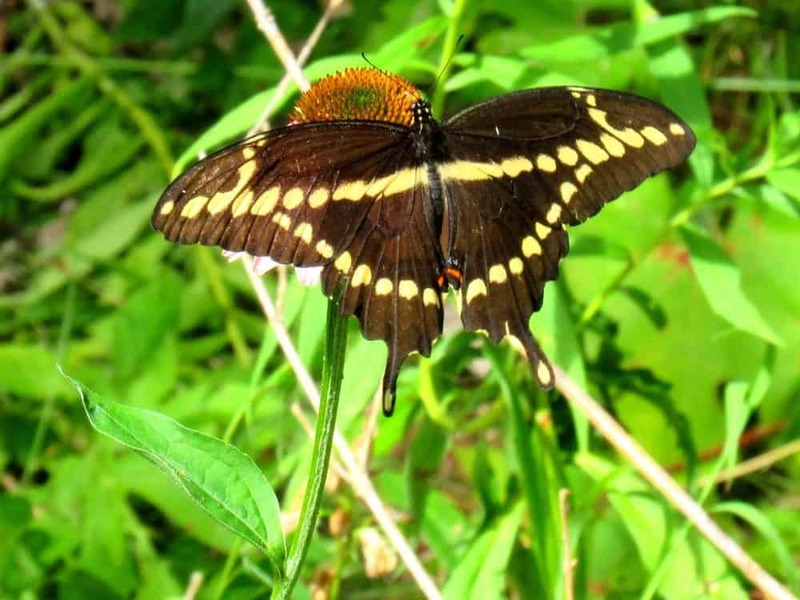 Pay special attention to the butterfly’s size, wing shape, color and pattern­ing. 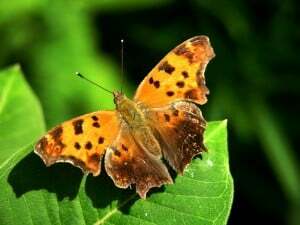 The pattern on the underside of the wing, usually visible as the butterfly feeds, is especially important for identification purposes. If you would simply prefer that insects to come to you, then moth-watching may be your thing. Mothing, as it is sometimes called, can be as simple as leaving on the porch light and checking periodically to see what’s clinging to the screen door. Unlike butterflies, most moths are nocturnal. However, there are exceptions. 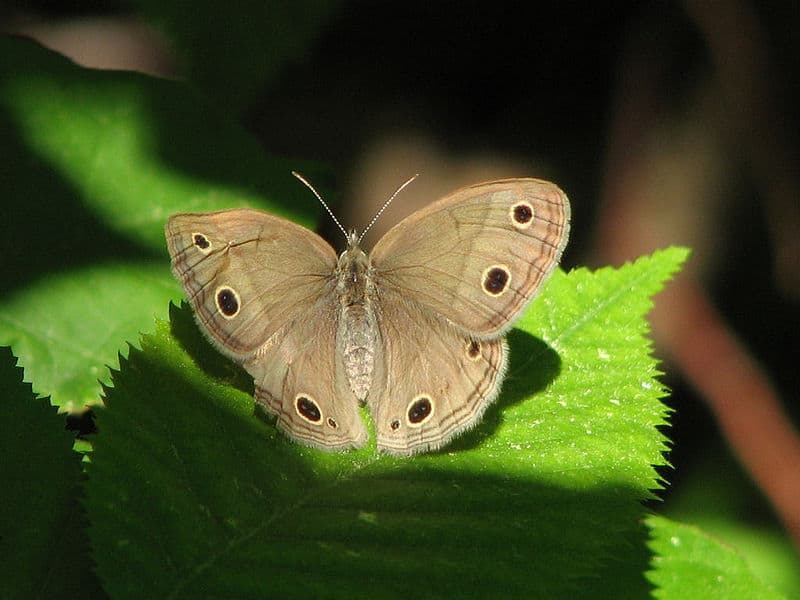 To distinguish moths from butterflies, remember that butterflies have club-like knobs on the ends of the antennae and usually perch with their wings held upwards. Moths, on the other hand, perch with their wings outspread and have antennae that closely resemble bird feathers. 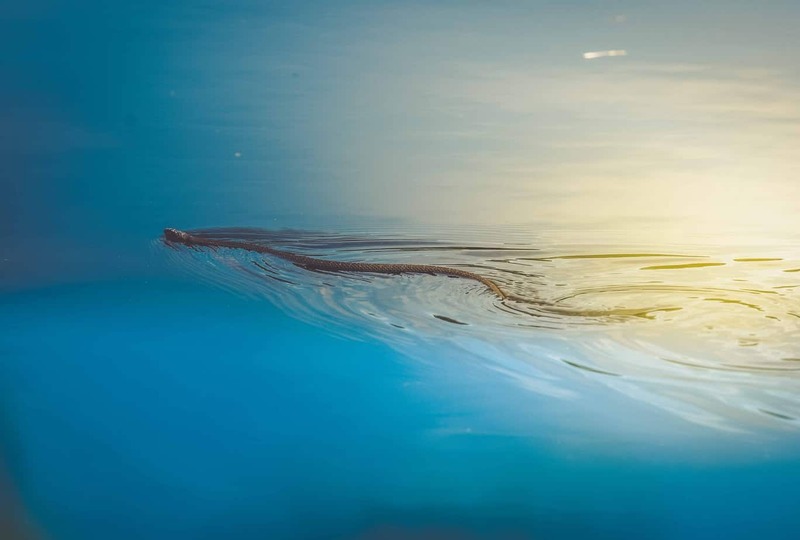 While a simple incandescent light will attract some moths, the most effective bulbs are those that project light in the UV spectrum such as a black light CFL. Grow bulbs, designed for plants or aquariums, also work well. An even more effective option is to use a mercury or sodium vapour bulb, which broadcast an extremely bright light and draw in moths from further away. Set the light up in front of a wall or, even better, a white cotton sheet where the moths can land and be studied at close range. Not all moths, however, are interested in lights. 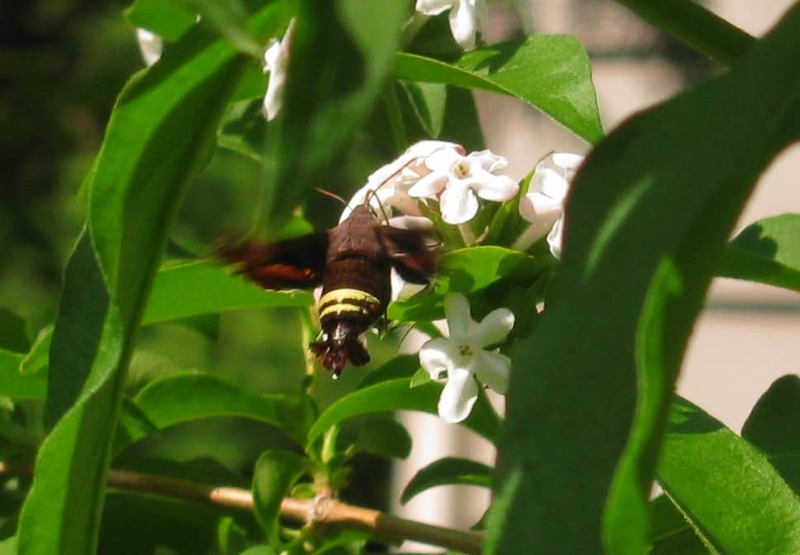 Some are nectar-feeders and will come to bait such as over-ripe bananas. A particularly effective way to entice moths is with a syrupy “goop.” One mixture calls for one over-ripe banana, a dollop of molasses, a scoop of brown sugar and a glug or two of beer. Mix the ingredients in a blender and spread the concoction on a tree trunk or a hang­ing rope. Check regularly after dark to see what has been attracted. With any luck, species such as Catocala (underwing) moths will show up. 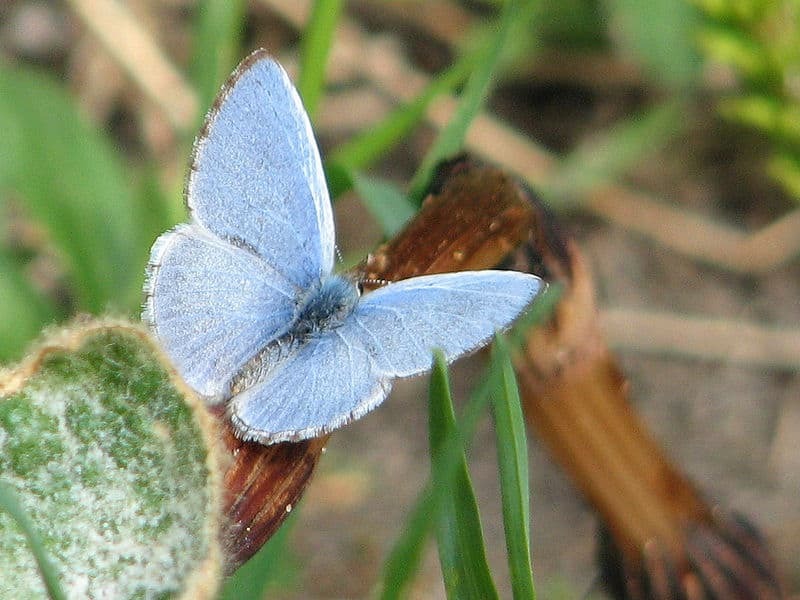 During the day, the bait may also attract butterflies. A lot of the fun in mothing comes from taking pictures of the insects. Be aware, however, that using a flash may create washed-out images. A way to get around this is to carefully catch the moth in a small container, put it in the fridge overnight and take a picture the following morning using natural light. Place the moth on a pleasing background such as a leaf or a piece of bark. Make sure your camera settings are ready, because you will only have 30 seconds or so before the insect warms up enough to fly away. Placing a ruler beside the moth for one of the shots serves as a simple size reference. 1. 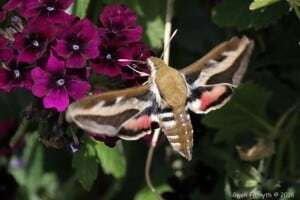 Start by focusing your ef­forts on the larger moths and those that stand out from the rest because of their large size and distinctive colours and markings (e.g., giant silkworm moths, sphinx moths). 2. 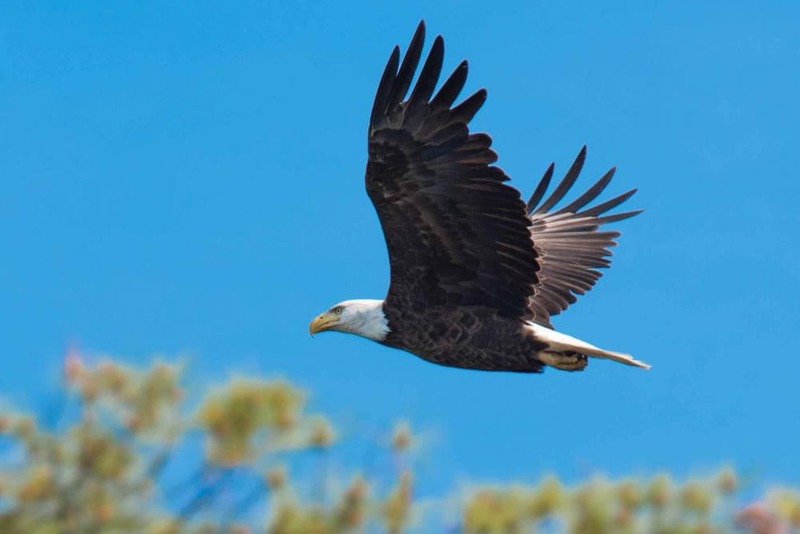 Take note of how it holds its wings when at rest. Are they spread out to the side or tent-like over the back? The former is probably a moth in the family Geometri­dae while the latter likely belongs to the family Noctuidae. 3. Once you have a rough idea of what family the moth might belong to, look more closely at the patterns on its wings and compare these to the photo­graphs in a guide such as “Peterson Field Guide to Moths” by Seabrooke Leckie. 4. Keep in mind the time of year. Like butter­flies, the moths you see change with the seasons. Knowing a given moth’s flight period will help to narrow down the species. 5. 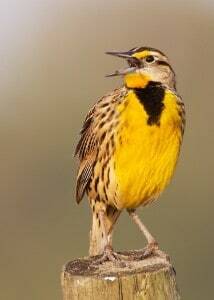 Look at the range maps and make sure the species occurs in your area. 6. Check the type of host plant (larval food plant) the moth requires. 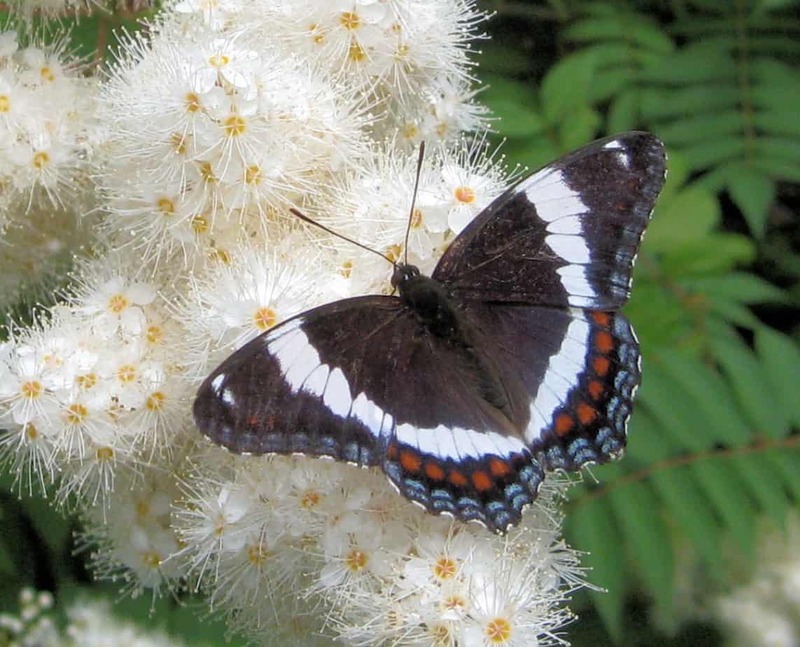 If, for example, a given moth lays its eggs on plants that don’t grow in the Kawarthas, you can probably discount it. 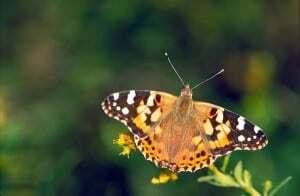 Almost everything that applies to butterfly-watch­ing is also pertinent to the observation of dragonflies and their close cousins, damselflies. 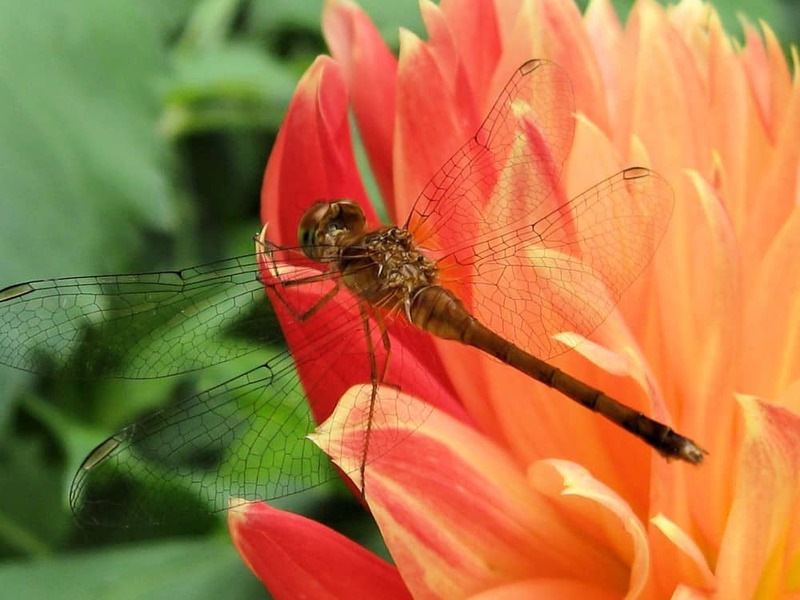 Collectively, these two groups of insects are known as the Odonata or simply “odonates.” Like butterflies and moths, there is a great deal of species diversity, and they, too, make wonderful subjects for photography. On warm, sunny days, dragonflies and damselflies can be found around any wetland, lake or river. 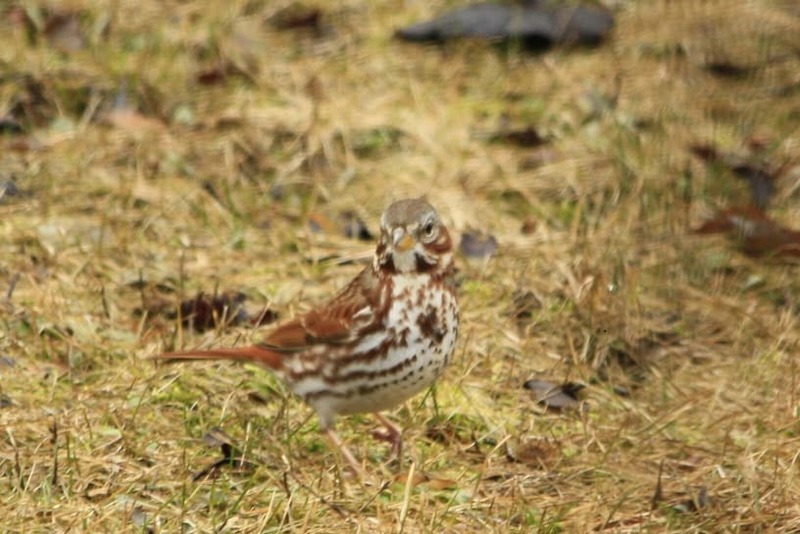 Many species are also attracted to meadows, roadsides and backyard gardens. In addition to using binoculars and a camera to help with identification, it can be fun to catch the insect in a butterfly net. It can then be transferred to a transpar­ent jar or plastic bag. 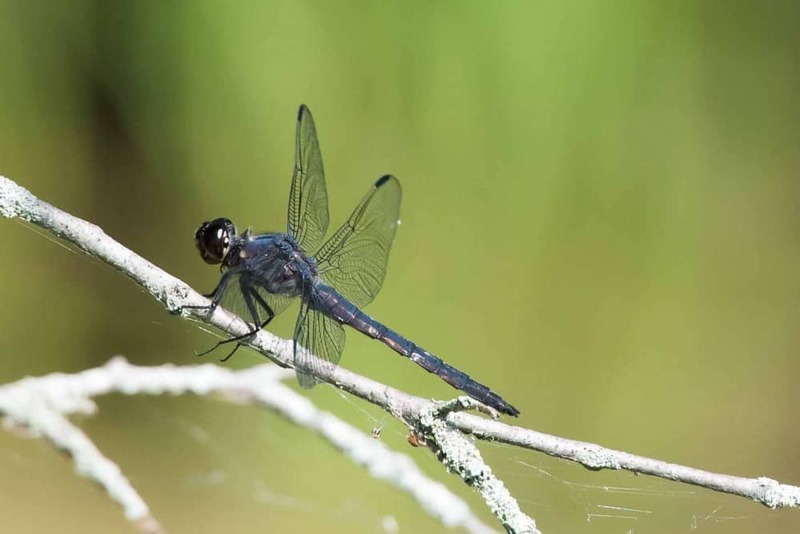 Despite what many people think, dragonflies cannot sting you and their “bite” – on the rare occasions when this happens – is usually more startling than anything else. 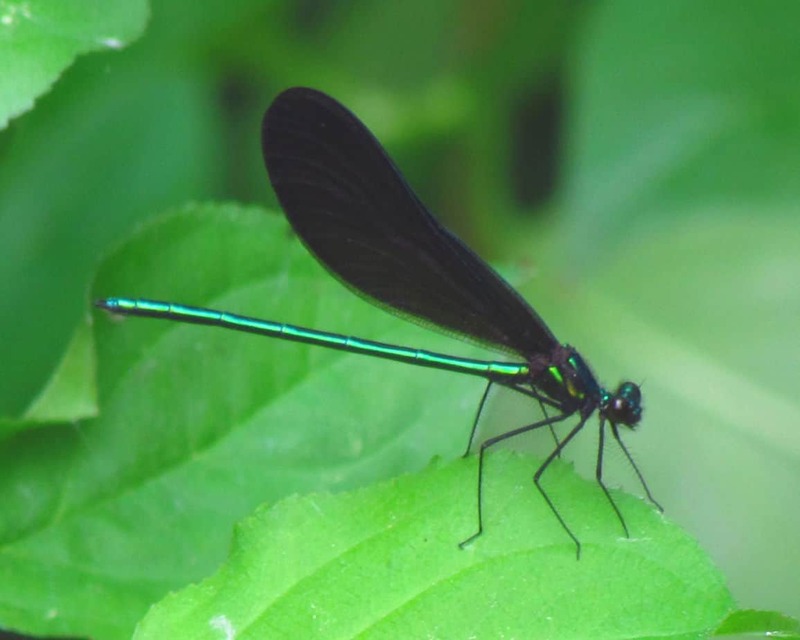 Here are a few simple suggestions to get started as an odonate-watcher. 1. Learn the different dragonfly (e.g., darners, skimmers) and damselfly (e.g., bluets, spreadwings) families. 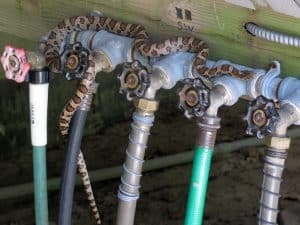 Knowing the family will greatly narrow down the choice of possible species. 2. Pick up a copy of “The Dragonflies and Damselflies of Algonquin Provincial Park and Surrounding Area”. Written by local naturalist Colin Jones and illustrated by former Peterborough resident Peter Burke, it covers all of the species you are likely to find in the Kawarthas. 3. 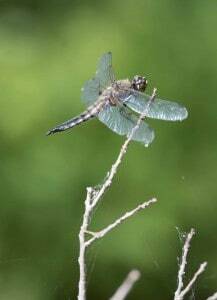 For dragonflies, take special note of overall size, eye position (e.g., do the two large eyes touch each other?) 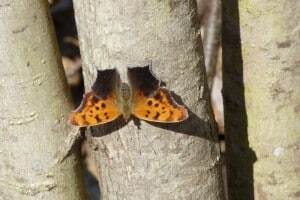 as well as any patterning on the thorax, abdomen or wings. 4. Remember that the male and female in many species can be quite different. 5. As with common moths and butterflies, you may want to start collect­ing odonates to have a small reference collection. Doing so will not have any impact on the population. Guidelines for proper collecting (e.g., using glassine envelopes) can be found online. 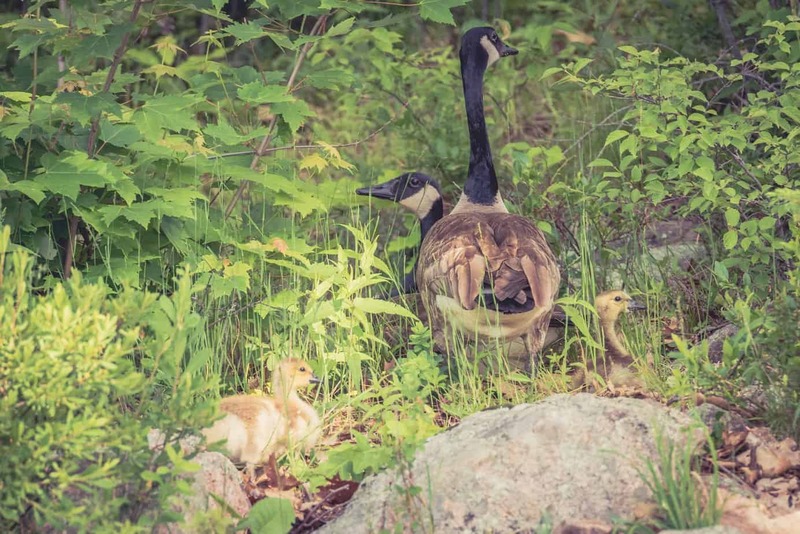 You will find more ways to develop a stronger connection to the natural world in my new “Big Book of Nature Activities: A Year-Round Guide to Outdoor Learning” which I co-wrote with Jacob Rodenburg, executive director of Camp Kawartha. The book will be available in June. 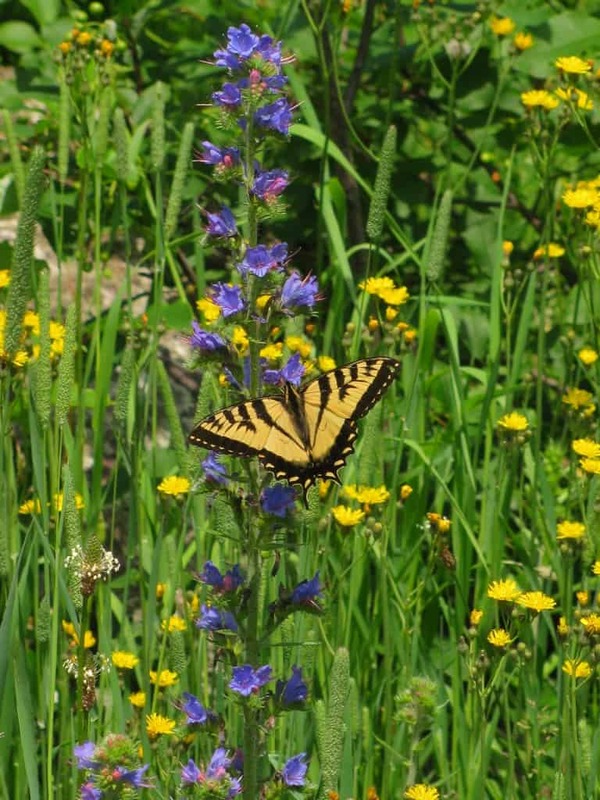 Giant Swallowtails right on time … and first Monarch of the year, too! 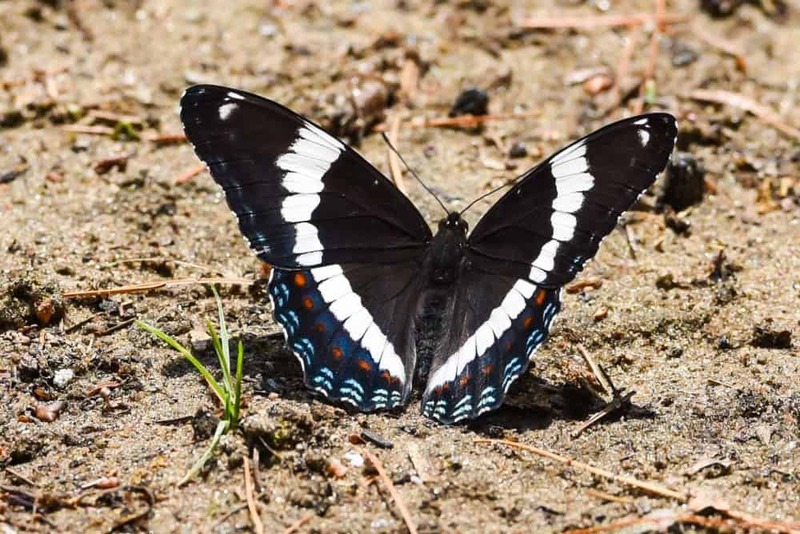 On May 30th, on my way to Stoney Lake, I saw my first Giant Swallowtail of the season as it flew across the road in front of me on County Rd #46 between Round Lake Rd, and Church Rd north of Havelock. Seems to be right on time for first flight of Giants, based on observations of the past few years since they became suddenly abundant in the county. Upon arrival at Stoney, the client I was going to see about some gardening told me she had just seen her first two Monarchs of the season, the day before (May 29th) – one at her home in Toronto, and the other at her island cottage on Stoney Lake. Seemed a little early to me based on my own observations of the species, but I have no reason to doubt her. It may have slipped my mind to report these, but the fine article recently posted here by Chip Taylor about Monarch status/predictions reminded me. Many Spring Azure butterflies hanging around the dogwoods in my yard. 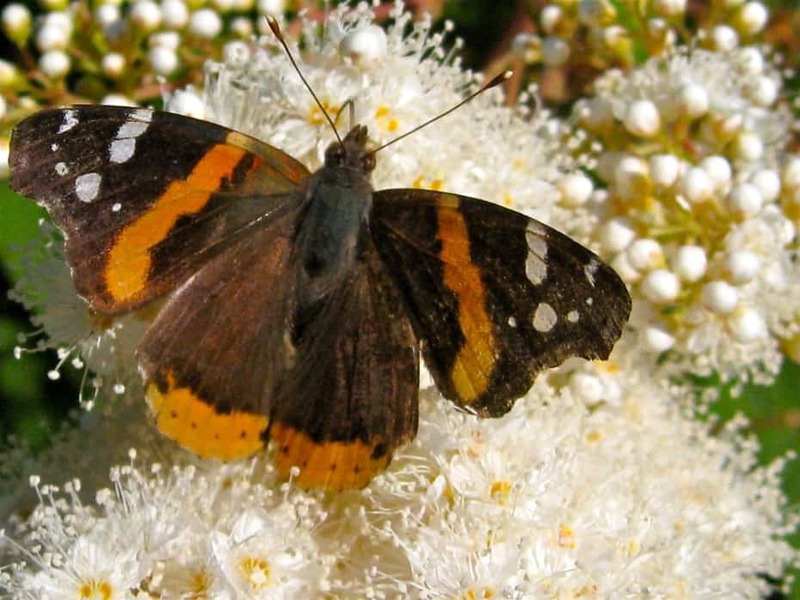 American Lady laying eggs on the Pearly Everlasting and a Red Admiral checking out the nettle. These butterflies really go for their host plants, so we try to plant as many as we can and it works! Bob Prentice and I visited the northeast of the County and found five new butterflies for the year – Gray Comma, Northern Spring Azure (Note: The Spring Azure in this area has now been re-classified as Northern Spring Azure, Celastrina lucia), Olympia Marble, Hoary Elfin, and Henry’s Elfin. We also heard a Red-shouldered Hawk calling. Wilson’s Snipe calling at the north end of Northey’s Rd at 14th Line of Smith. So, as of yesterday, my expected estimate of 60 that I had predicted seeing this season was wrong, but I am happy to say that is was wrong on the PLUS side of things!! 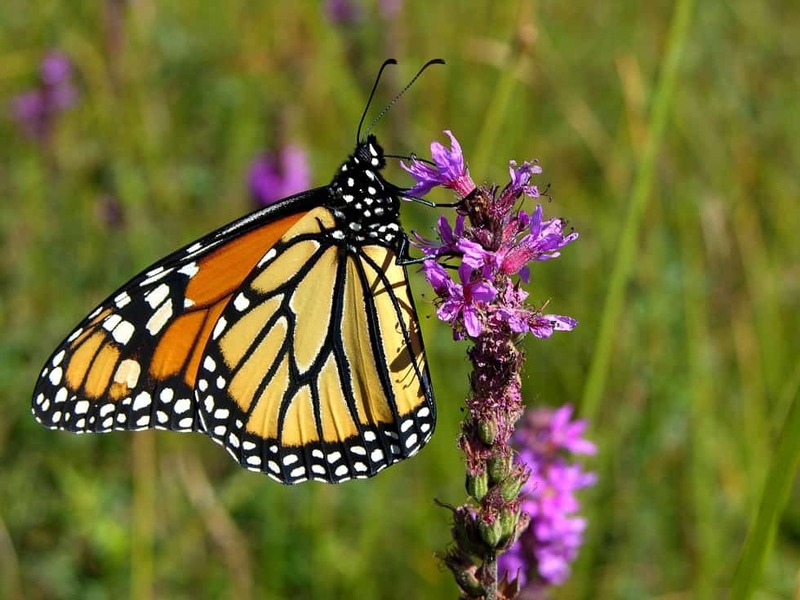 Now, 100 or more should not be out of the question, as there are still some weeks of monarch season to go. 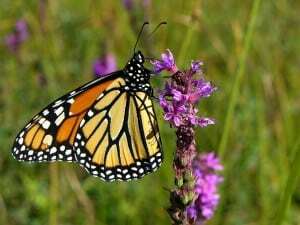 I plan to film some of the raptor migration in the coming weeks, both inland, and along Lake Ontario, so Monarch sightings will surely jump during those times. In fact, in the past, the most monarchs I have seen in a single day have been while watching the autumn hawk movement. Cold front coming Friday night after hot, muggy and then thunderstorms, so Saturday should be fantastic for hawk watching, (and counting more Monarchs). I will keep you posted. I still have my eye out for second brood Giant Swallowtails, but am still at 19, and have not seen one for nearly a week now. Here at our home near Lanark, there has been another banner year for the Giant Swallowtail. It’s been almost a repeat of the season of 2013. 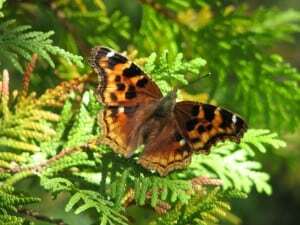 The first generation emerged in early June and ended in mid-June, feeding mainly on Dame’s Rocket and the orange hawkweed. The second generation started on August 2 and the butterflies have continued flying (save for one rainy day) and nectaring on our garden flowers up to today. They are very abundant with one to 5 seen simultaneously every day. 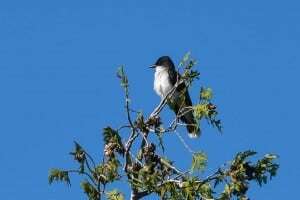 Both the spring and summer flight periods are about 3 to 4 days later than last year (I don’t think I saw any in September of 2013). 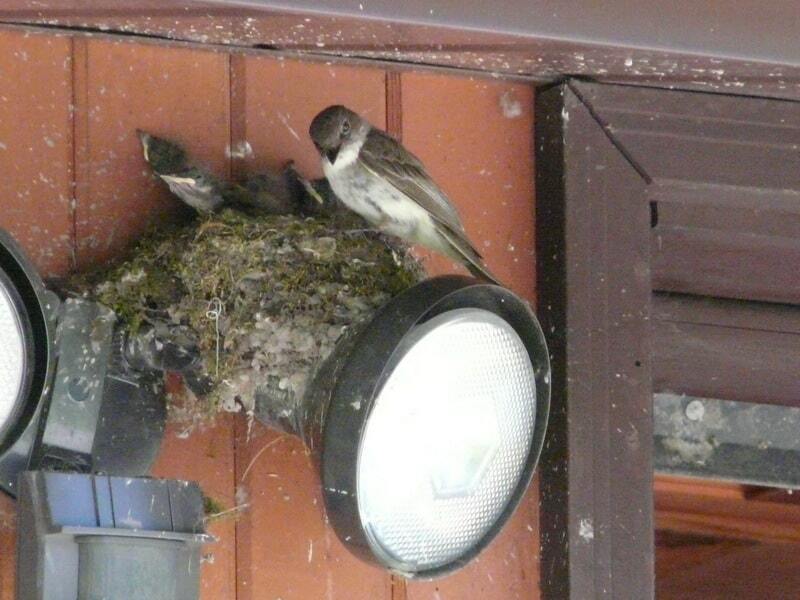 This is Sept 1 and we counted 5 present around the yard. The midsummer generation feeds on Cone Flower, Garden Phlox, Buddlaea, and Tithona rotundiflora (Mexican Sunflower) with the latter in full glory right now. 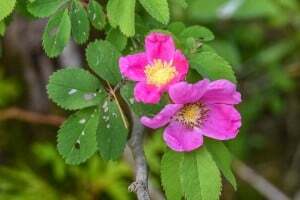 The Prickly Ash, their essential food plant in these parts is very abundant in open meadows and forests around here. Also today there are 3 Monarchs nectaring on the Mexican Sunflowers, so six sightings for this species in the past week. 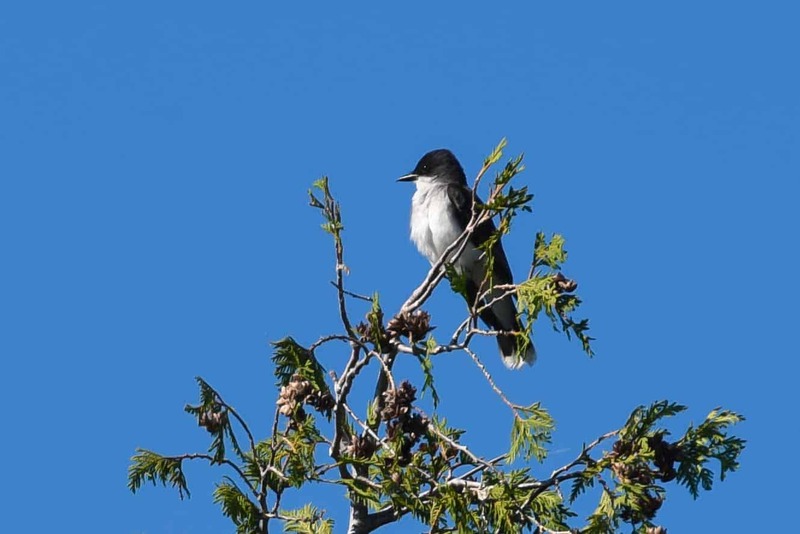 It is good to see the population seems to be re-surging and likely, there will be quite a concentration later at Point Pelee and along the shores of Lake Ontario. 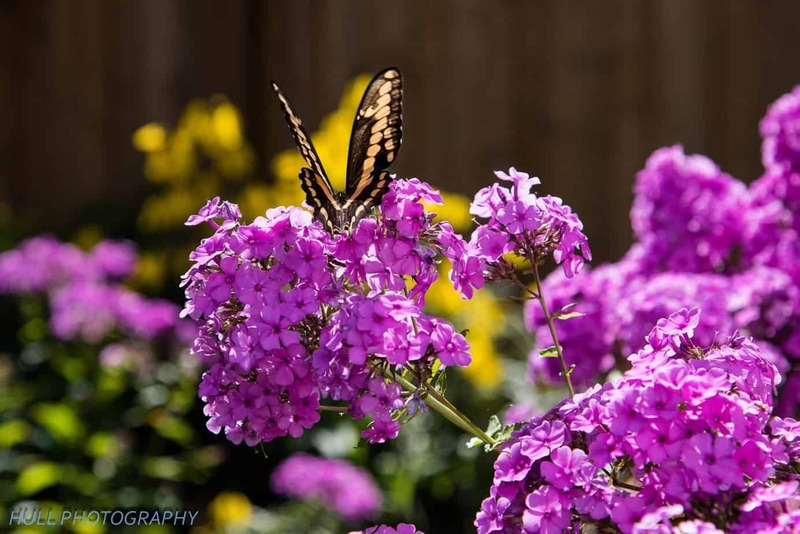 Bit of a butterfly garden around here…. Today, we had two Monarchs visit the Buddleia in our garden. Over the past week, we’ve had a single Monarch come to the garden most days. 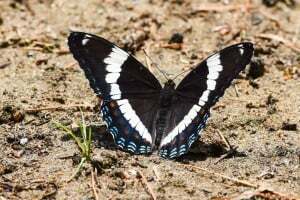 Yesterday, there were also a Giant Swallowtail (second of the year), a White Admiral and a Red Admiral. 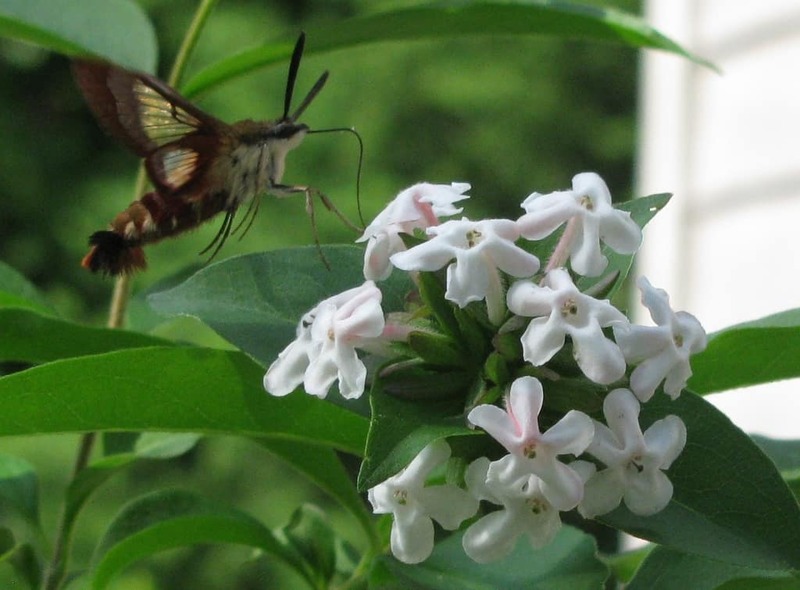 The admirals were on the Buddleia, while the swallowtail preferred the phlox. Blair Hamilton of Pigeon Lake also had a Giant Swallowtail in his yard today. 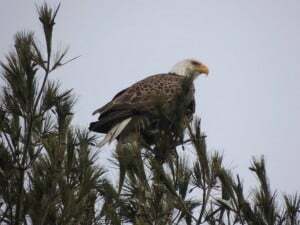 It was laying eggs on his Hop Tree. Where are the Butterflies This Fall?